The room price or rate range for each hotel is indicated. See the $-symbol key in the sidebar. Included in the list is a guest house and large hotel rooms. All the rooms have private bathrooms (ensuite) unless otherwise mentioned. Most of the rooms offer a double bed plus single beds, though one has bunk beds. Usually, an extra roll-away bed and/or a baby cot (crib) can be offered, as well. Confirm your family’s sleeping needs with the hotel directly to make sure your room will be prepared for you. 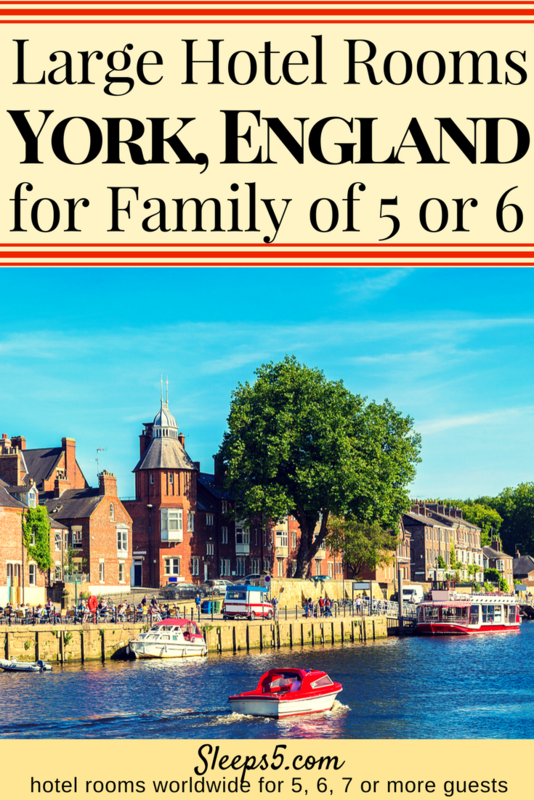 Though York is a smaller city, there is a variety of hotel offerings for family travel budgets. Select one with $$ for nightly rates on the cheaper side. For a more luxury experience, select one with $$$$ or $$$$$. Keep in mind that the nightly rates fluctuate quite a bit seasonally, or with main events occurring nearby. In the list below, click on the hotel name for more details. The detail information will include a location street map, the hotel’s address, phone number, and contact links, room and bed configuration options, and tips for how to book a room there. We hope you are able to find an ideal family room! York is great to visit with kids! If you know of another hotel or guest house that we should list here, please tell us. You can comment below or email us through our Contact Us page. Check out the Visit York website for city info and what to see along its twisting cobblestone streets. For additional UK family destinations, you might also be interested in the Sleeps5 list of family hotels in the Cotswolds, or the more than 20 family hotels for 5 or 6 in London.